The irony is that Limebike was begun in Berkeley, at the Skydeck incubator center. Just goes to show how anti-environmental and anti-business Berkeley has become. A 34-year-old bicyclist died Monday night after running into an SUV, the California Highway Patrol said. According to the CHP, the bicyclist was going east on Canal Road but was in the middle of the road and not in a bike lane. A 51-year-old Pittsburg man driving a Ford Explorer also was going east on Canal Road and was behind the bike, when the bike abruptly made a left-hand turn and plowed into the right-hand side of the SUV. There are some troubling issues with this narrative. A cyclist is expected to move out of the bike lane into the middle of the road when making a left-turn. If he had already taken the lane, then his left turn was not necessarily abrupt. Of course, it would be helpful to know whether the cyclist signaled his turning intentions, but unfortunately he is not around to give his version of events. The CHP also reports drugs/alcohol may be involved, but that does not excuse a dangerous passing maneuver. Unless there are some other details not being released, this is looking like a case of investigators having windshield-bias. As you can see, the retail center looks like just another suburban strip mall (click image to enlarge). In general, according to BART, the neighborhood is still over-parked and is not entirely consistent with BART’s TOD policy and guidelines that recommend against parking minimums and recommend lower parking maximums. Eliminating parking minimums and reducing parking maximums can help reduce the cost of housing, consume less valuable land near transit and reduce associated environmental costs, such as water pollution from increased impervious surfaces. 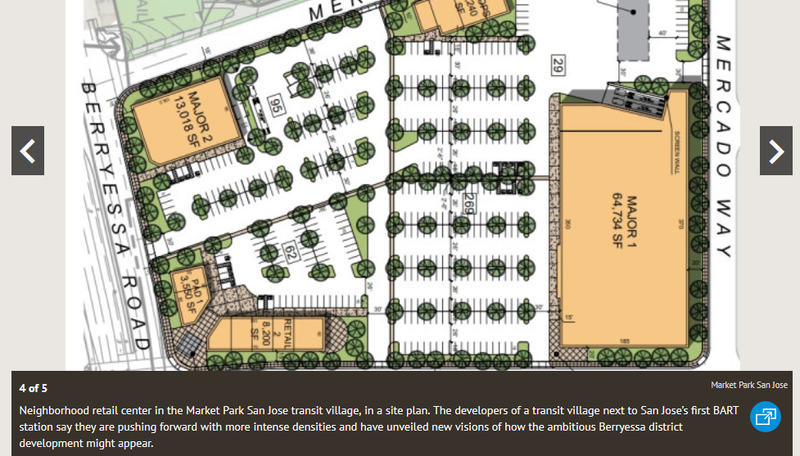 In addition, BART expressed concern that the location of the additional parking capacity in such close proximity to the BART station entrance at a key point of pedestrian and bicycle access to the station will diminish the placemaking features of the development and discourage active and shared-ride modes of transit access, as well as diminish the overall quality of the transit­ oriented development. This is yet another example of local government blocking infill development around transit stations — and why it is so important to pass SB-827 (Wiener) which enacts mandates for transit-oriented development. You can read all of BART staff comments on the Isabel station plan here.